One of the biggest failures of businesses today is neglecting their digital presence or operating an outdated website. If you want your company to prosper in the digital world, having just social media accounts isn’t enough; you need to step up your game and show your customers an organized and up-to-date website to visit and interact with. I like the current design: In reality, it’s not about what you ‘like’, but what is ‘effective’ or ‘necessary’. I update my website’s content regularly: Before people read content, they are either attracted or turned off by the visual appearance of the website. Design does not matter: Actually, design does matter. Research shows 38% of people will stop interacting with a website if the layout or content is unattractive. My website is better than those of my competitors: Even if this is true, you can do much better with a well-designed website that drastically improves your conversion rate. 38% of people will stop interacting with a website if the layout or content is unattractive. In this article, we will highlight and examine 5 ways to determine if your website is due for a redesign. Here we go! Does your website look like one built in the 80’s? If your website was designed at least 3 years ago, it’s probably too old. Consider having a redesign because websites age over time. Your website needs to look modern enough to attract and engage visitors. Its design must also be aesthetically appealing. Regularly check the copyright (©) year at the bottom of your website to ensure it’s the current year. A past date makes it look like your website has expired or isn’t active. If your website’s existence isn’t noticed on search engines, you definitely should consider a complete redesign. Redesigning your website would give you the opportunity to rethink your content strategy and re-write your content in a way that is search engine friendly. SEO is no joke if you are serious about success online. A new and modern website should be designed with this tip in mind. Be mobile friendly (more on this below). Related: What is SEO and why should you care? An effective website is a superb marketing tool and if designed properly, should help your business grow. If your current website doesn’t contribute to the goals of your business, you should definitely have it redesigned. Considering the fact that 40 to 60 percent of website visitors use mobile devices, a mobile-friendly website is not only great, but also absolutely necessary. If your website isn’t ‘responsive’, then it is long due for a redesign. A responsive website is one that adapts seamlessly to the screen sizes of the device being used by a visitor. This kind of website resizes, hides, shrinks, enlarges, or moves the content to make it look good on any screen. If you aren’t convinced yet, it’s important to know that your website’s ranking on search engines are highly dependent on mobile friendliness. When a user searches via a mobile device, Google will typically rank a mobile-friendly website higher than one that isn’t. Are your current values and core goals still well communicated by your website? Are all features of your website working correctly? If you notice that some parts of your website are outdated or not working well anymore, then consider removing them. If however, these constitute a major part, having a redesign is your best option. It is important to keep your website fully functional and relevant to website visitors. You may even realize that over time, your business has outgrown some content or functions on your website, and you need a redesign to update the information and also accommodate new and important content. Please note that your website does not necessarily need to be guilty of all the points above for you to consider a redesign. If one or more of the points above describe your situation, we recommend that you have your website redesigned. From time to time, you might even consider visiting your competitors’ websites to see what they are doing better than you in terms of website design. Your website is a visual representation of your business and as such it must be excellent. PS: If you’ve known us for a while, you’d know that over here at CKDigital, we recently redesigned our website. The old one was great and was a conversion-machine, but honestly, we had outgrown it: we had new team members, wanted to showcase more projects, and generally provide more information. Hence, our new website! Do you think there are more reasons to redesign a website that we missed out? Share with us in the comment section. Awesome post. i must however say that a beautifully redesigned website does not automatically leads to increase in conversion, if necessary issues are not fixed. By necessary issues, i mean, analytics and user feed back are not core to the new website resigned. Redesigning a beautiful website is no longer enough. a website must not just speak to the eyes of consumers, but i must also speak to their emotion and decision making part of their brain. ConversionXL, in a recent research said that 65% of site visitors are going to judge the credibility of your business based on your website. So, i think redesigning a website is an awesome idea, but developers needs to have an idea of conversion rate optimization, to better make informed choices. Damilola, you have done a great job. Thank you for reading, Damilola. I totally understand your point, Conversion Rate Optimization is an important aspect of web design. I’ll definitely consider writing on CRO for a future post. First impression, as popular saying goes, matters a whole lot. You can’t joke with prospects that are landing on your website the very first time. A Recent study called, “Trust and Mistrust of Online Health Sites” was recently carried out. In this study researchers asked subjects to look at two websites: One website was professionally designed. The other looked outdated and ugly. When the researchers asked people why they mistrusted the information on either site, 94% said it was because of design. And get this: the content on both websites was EXACTLY the same. What does this have to do with your Wow Content? The fact is, people make HUNDREDS of micro-impressions about your content before they’ve read a single word. And those impressions are based 100% on your content’s design. The better it looks, the better impression you’ll leave (and the more people will link to it). What impression would they have of you and the quality of work you’ve got to offer ESPECIALLY FOR FIRST TIMERS? Damilola Akinwunmi, your web design article is informative and very useful and it is worth sharing. 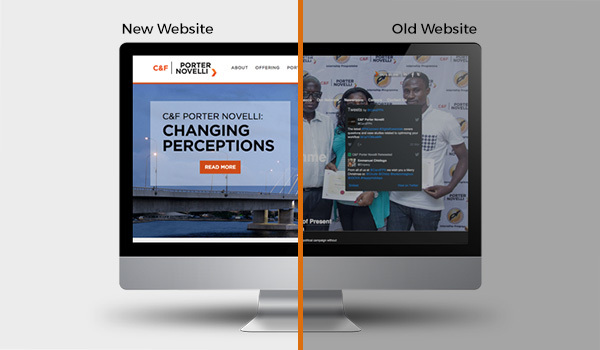 With these listed 5 ways to website re-design, small businesses and large firms in Nigeria have no excuses again. I am sharing your article to be list because of its usefulness. Great content.